Tuning your best snare drum is important for getting the best sound and life out of your snare. Drum keys today come in all different shapes and sizes. There are many tools on the market that promise to help with the tuning process. 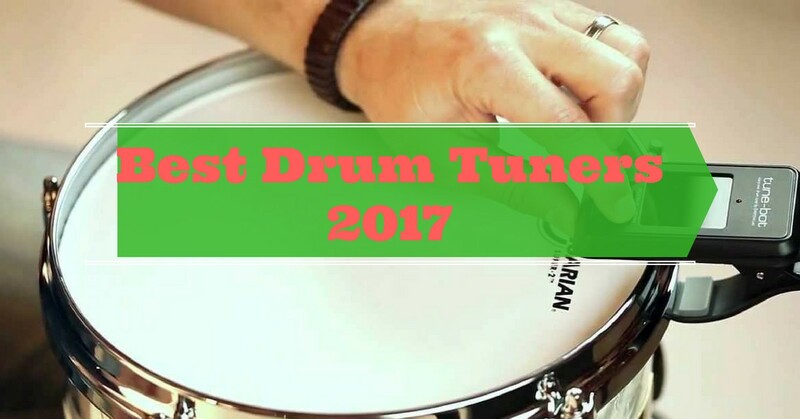 Here we take a look at the best drum tuner as well as a very important 4th piece of the drum tuning puzzle. Getting your drums in tune may be difficult – it requires a good ear to separate the basic tone of the drumhead from the rest of the overtones. This also depends on the pitches of the shell and heads, as the perceptible pitch of the drum can fall or rise after impact. Directly measuring the head tension of a drum enables you to tune your drum accurately. The DrumDial drum tuner easily tunes bass drums, rack toms, snare drums, and tympani without having all the constant tapping. The Drumdial does not measure the torque of the tension rod, but actual tympanic pressure. 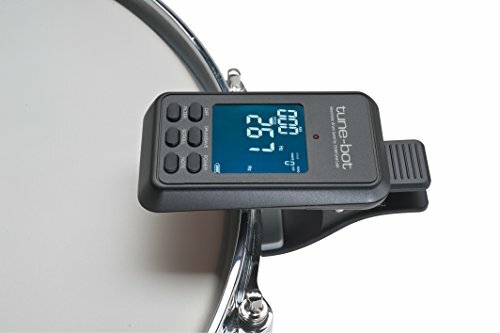 It will prove relatively easy to tune drums accurately with the DrumDial tuner. The DrumDial facilitates consistent tension for untuned and tuned membranophones. It helps maintain a certain pitch after determining your preferred pressure values, although most drumheads are categorized as indefinitely-pitched instruments. Definite-pitch instruments such as boobams and tabla can also be precisely tuned with the DrumDial. In a symphony where a tympani player needs to retune drums for the sections in a single composition, the DrumDial is beneficial. Head tension measurement allows for easier tweaking to top and bottom drum heads, in relation to each other. The Drumdial simply guides the tuning process. 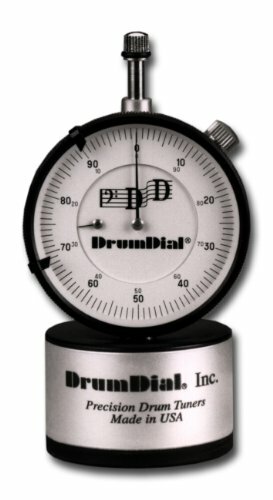 Tips on using DrumDial Drum Tuner: Place the resonating head some PSI lower or higher to get your target sound. You can make consistent changes or return to different settings, as it’s all indicated on the meter. You can save various tuning strategies, such as settings for concerts, rehearsals, small gigs, and so forth. Being “in tune” is all about the relationship between one sound and another. Doing so may affect the sound, but the sound itself is the deciding factor on whether or not something is “in tune.” The Tune-Bot directly measures sound, and that is what makes it superior to the other tools out there. it also gives you 80 save slots for specific drum pitches and tensions, so you can find your drum’s sweet spot every time. Years of experience used to be necessary to accurately tune drum heads. It also seemed to take a long time to tune a single drumhead, but many new tools have been developed to resolve that problem. 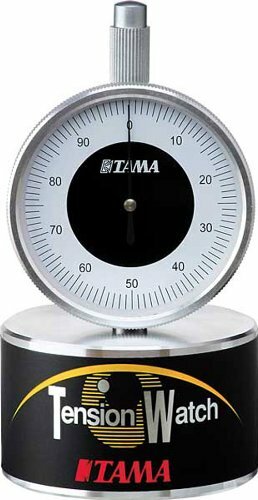 The TAMA Tension Watch gauges real head tension, and not the tension in tuning rods. The tension value is displayed on a meter, making it easy to record your preferred settings and duplicate this tuning at other times. You may also use the sample tunings contained in the instructions. The TAMA tension watch may not give you good tuning the first time. The concept behind the tension watch is that the user should tune a drum, study the readings, and re-apply the settings later on. The tension watch works in an idea similar to the DrumDial, but the DrumDial wins over the tension watch as the DrumDial is more user-friendly and results in more consistent tuning. The tension watch is quite sensitive, which does not necessarily mean that it is a better tuning implement than the DrumDial. The extra sensitivity of the TAMA Tension watch may even result in longer tuning time per drum head. The comparatively ‘coarser’ readings one gets with the DrumDial are enough to get the lugs in proper tune. It is unnecessary to get equal tension between 6 or 8 lugs to the degree that the tension watch display (which amounts to approximately 1/10 of a drum key turn). 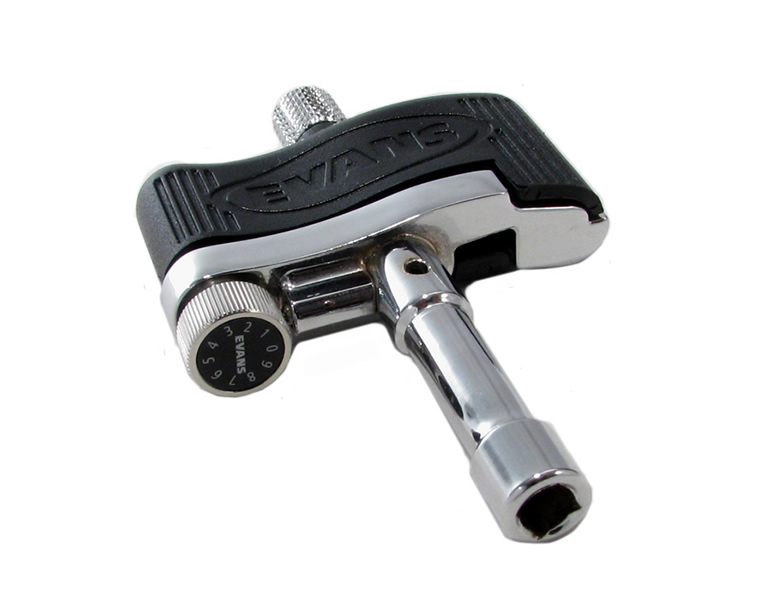 The Evans torque key is a good tuning tool to have for getting your drumheads in tune. The knob on one end helps change head tuning fast. You can use it to give your drums a quick adjustment on stage, even in the dark. The repeated impact on the skins may cause your snare to drop a lug, for example, and the Evans torque key can quickly rectify the situation. The key handle may be set to release at a particular tension, helping ensure even tuning at every lug. The knurled knob and ergonomic grip allow for comfortable, fast spinning. A magnetized head fixes the key in place for quick adjustments between songs. It is also constructed of durable, heavy duty drop-forged steel, and comes with a lifetime guarantee. The torque key is useful for starting to tune your drums, and your tuning rods may turn out to be more even. Various rods may have differing amounts of tension, but the torque key aids in leading you toward an accurately-tuned drumkit. This relatively inexpensive tool is a must-have. The DrumDial drum tuner, Evans torque key, and TAMA tension watch are all good tools to tune your drums with, but excellent technique and a good ear are always essential to getting your drums to sound great. The DrumDial is a fantastic gift for any drummer, as it helps in training you to recognize when your drums are in tune. The Tuning Process You can also check the display to ensure that your heads are at the preferred tension. Here are some tips for great drum tuning: There is no right or wrong way to tune a drum kit – it all depends on how the drummer wants his instruments to sound. It may take some time to tune a kit, especially at first. For the beginner, it may be necessary to utilize small increments while fine-tuning – ¼ key turns are recommended. Drums are created from a wide range of materials, such as brass, copper, steel, and wood. This enables the drums to be tuned to an almost infinite variety of textures and tones. Try out different tunings to find the overall tone that sounds good to you. Consistent tension for the bottom and top heads is needed to achieve good tomtoms tone. You can take a drum off its mount to facilitate tuning the bottom head. Again, experiment to find a pitch you like, and tune the drum with that pitch as a reference. For a thick and tight snare sound, start from the bottom head! Use the technique you would with a snare drum, and find out if the tension is consistent all around the drumhead. Some may prefer the bottom head at the maximum degree of tightness, to allow the snare to ‘snap’ as it is hit. Remember that tuning an entire drum set is mostly dependent on personal preference. Tensions and pressure values are dictated by the drummer’s’ head selection, drum mount system, playing style, and type of music; among other factors.